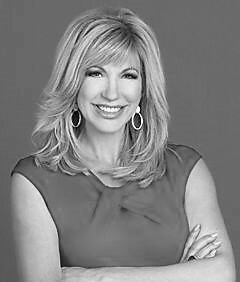 Leeza Gibbons, Social Entrepreneur. Talk Show Host. Winner of Celebrity Apprentice. Business Speaker. Breathe, Believe, Receive, A Caregiver’s Lifeline. The spectrum of Leeza’s career in entertainment and news media is diverse and impressive. Her on‐camera hosting dominance in the entertainment‐news and talk‐show arenas, ranges from the most popular entertainment news show in history, Entertainment Tonight, to her award‐winning daytime talk show, Leeza. More recently, in 2013, Leeza published her first NY Times Bestseller, Take 2, a personal growth guide designed to help people recreate themselves and hit the reset button on their lives. Later that year, Leeza won the 2013 Daytime Emmy for Outstanding Talk Show Host for the PBS show ‘My Generation’. This past spring, Leeza was crowned the winner of NBC’s ‘Celebrity Apprentice’. Having raised over $700,000 for her foundation, Leeza became the 2nd woman ever to win the long-standing competition show. This season also reignited the storied franchise for NBC as the show delivered their highest overall ratings in nearly 5 years. Recognized as a social entrepreneur, Leeza has become one of the leading voices for issues facing family caregivers. When her mother and grandmother were struggling with Alzheimer’s disease, she created what she wished she and her family had and started the Leeza Gibbons Memory Foundation. Her training as a journalist united with her compassion and business savvy when she opened the foundation’s signature programs Leeza’s Place and Leeza’s Care Connection, offering free services for family caregivers encouraging them to call on their courage and summon their strength for the long journey ahead. Over the years, Leeza has become known as a trusted girlfriend, valued confidante, and source of inspiration and information, empowering women to show up for their lives with confidence and pride. Whether it’s her scrapbook line honoring the value of memories, her jewelry collection to symbolize transformation, or her cosmetic products to reveal inner and outer beauty, Leeza develops programs and products to help women claim their strength and rewrite the story of their lives. Recognizability, Relatability and Reputation… that and more is what you get with Leeza’s as she uplifts, empowers and motivates audiences and viewers to get more out of life and business. Leeza currently resides in Los Angeles with her husband, Steven Fenton. She has three children: daughter Leksi and sons Troy and Nate.